Gules, three wolf's teeth issuant from sinister and a chief argent. Nataliia Anastasiia Evgenova Sviatoslavina, known to all as Nataliia has been in the SCA since around 1994 and resides in the Barony of the Bridge. 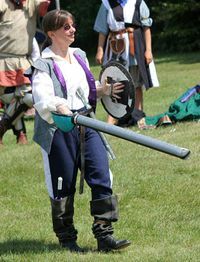 Nataliia has many passions in her life, the first being rapier fighting which drew her into the society in the first place. 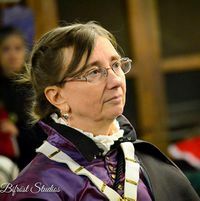 Once she dove in head first, she discovered heraldry, armored combat with spear, marshaling, rapier melee fighting, calligraphy and illumination, needlework, sewing, and loves discovering new things. Currently she pursues with great vigor illumination and is the Tyger Clerk of the Signet for the East Kingdom. Nataliia spends most of her time between rapier and illumination. Nataliia is a founding member of Sharc Pit and can often be found hanging out there coming up with some mischief or another. Nataliia is a Master of Defense, Mistress of the Pelican, a Mistress of the Laurel, a companion of the Golden Rapier, a companion of the Silver Crescent, companion of the Maunche, a Court Baroness with Grant of Arms, is a recipient of the Valiant (formerly Valiant Tyger), the Burdened Tyger and several Queen's Honor of Distinction. Nataliia Anastasiia Evgenova Sviatoslavina vnuchka is a late 16th century Rus traveling abroad in England, learning the art of defense from English, Italian and Spanish masters. Alternate Personna : Natalia Anastasia Fortuna, Italian artist late 16th/early 17th century. East Kingdom Tyger Clerk of the Signet, 2/2017 to the present. East Kingdom representative on Additional Peerage Exploratory Committee August 2013 to November 2014.
participant in the Laurels vs. Pelicans challenge to raise money for the Kingdom, 2012 and 2013. This is not official or anything, but a lot of fun. Art: Variety of classes on painting techniques, introductions to new scribes, Pennsic: sponsored Artisan's Row scribal 1/2 day 2014. This page was last edited on 15 August 2018, at 15:18.